The Bay Area may not have a dog in the fight, however San Jose does have a link to the Super Bowl. NFL Official Keith Ferguson, former athlete at Del Mar High School and San Jose State, was chosen as the Back Judge. Officials must have at least five years of experience, as well as having worked previous playoff assignments. The NFL determined that Mr. Ferguson was the highest-rated Back Judge with those qualifications. Look for Keith wearing # 61 – by coincidence this number was also on his Del Mar High School football jersey. While the men are throwing the pigskin around, I’ll be hitting balls around and enjoying the game on one of the many TVs at the California Billiard Club. $5.00 Food Buffet – Ask about their Draft specials. My car was in the shop most of this week, so I got a chance to try out our local public transit system, and overall I was reasonably happy with the service, and impressed with improvements since the last time I rode on VTA. Driving, I can get to work in 40 minutes, or 20 if I’m working odd hours and there’s no traffic. Riding VTA, it took me about an hour and 15 minutes to do the same trip. First I’d walk a few blocks (about 15 min.) to the bus stop. Then wait an average of 5 minutes for the bus to appear, then ride for 57 minutes, according to the official schedule. So that’s twice as long commuting each day, but I could read, or review my work day during the ride; something I can’t do when driving. Furthermore, that’s a big improvement over the last time I rode the bus. A year or two ago, I thought I’d save the planet a little bit and ride the bus a couple of times a week. Going in normally worked out okay, but coming home was disastrous. One time my bus, which was scheduled 20 minutes apart, didn’t come for 45 minutes. Also, I’d have to transfer from the cross-town route 23 to the local route 17 (If I can remember) to get close to home. With the transfers and missing busses, it could take over two hours to get home. Now, route 23 has been extended: instead of ending in downtown when going east, it continues out to Alum Rock, getting within walking distance of my house and saving me having to transfer. Also, route 23 now runs every 10 minutes at peak times, and at 20 minute intervals most other times, cutting time spent waiting at the bus stop. I still wouldn’t look forward to doubling my commute time, but these changes over the last year or so have made the bus a viable option for me when I just can’t drive. Kudos to the VTA for these service improvements! Panera Bread is offering free coffee this Wednesday, January 28, 2009. You will have a choice of its new Light and Dark Roast coffees, as well as samples of its three grilled breakfast sandwiches and new Strawberry Granola Parfait. Panera Bread will also invite customers to donate a dollar on January 28 to help support its Operation Dough-Nation Community Breadbox program. Participating bakery-cafes will join the celebration by matching customer donations made on that day. Donations support local programs that address community needs. For more information and other locations, check here. As reported on CNN and the San Jose Mercury News, a group of San Jose State journalism students took a 10-day road trip through the South to visit several landmarks of the civil rights movement before finishing at the inauguration on January 20. These are some of my friends, and I saw them as they came back to school utterly exhausted and simultaneously excited. Their stories have been bubbling out of their mouths long after their official storytelling projects were finished. They’ve been maintaining an excellent blog of their journeys, where these amazing photographs came from, and the professor has been keeping tabs on the students’ appearances in the media here. The Spartan Daily also published the students’ video here. 25 Years of the "Mac"
As noted at Ars Technica, CNet, and elsewhere, today marks the 25th anniversary of the Macintosh computer from Apple, probably one of Silicon Valley’s most widely known contributions to world history. The “1984” Super Bowl ad that launched the Mac 25 years ago can be seen on YouTube. The anniversary makes it a good day to mention one of the most interesting computer history sites on the net. 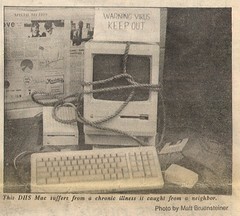 The Original Macintosh at Folklore.org collects over 100 stories about the early development of the Mac. Most of the stories come from Andy Hertzfeld’s book Revolution in The Valley: The Insanely Great Story of How the Mac Was Made. Posted in Books, History, Silicon Valley, Technology | Comments Off on 25 Years of the "Mac"
This weekend is the Bay Area Travel Show in Santa Clara. There will be seminars and exhibitors including: resorts, tour operators, cruise lines, etc. Check the event schedule here for days and times. Get in line early for Rick Steves. What a great way to shake off the winter blues by thinking about and maybe even planning some travel. For ticket pricing, check here. The fabulous “Leonardo: 500 Years into the Future” exhibit at The Tech Museum of Innovation is closing this Sunday. There are special extended hours this weekend. The exhibit will be open until midnight this Friday and Saturday. On Sunday, the exhibit will close for that last time at 8:00 pm. If you have a Discover Downtown Card, you will save $3 on General Admission tickets to the Leonardo da Vinci exhibit. Schedule well over three hours for the exhibit alone. Tomorrow morning (Jan. 22nd) the work of hometown artist Amy Brown will be featured on That’s Clever – HGTV. Set your DVR: 8:00 am on Comcast Channel 67. If you’ve noticed the old rotating neon sign for Food Bowl on McKee Ave has been dismantled, and been worried it’ll be demolished, I hope this will reassure you. 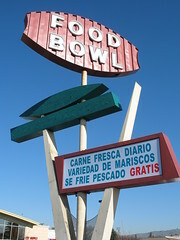 Although the shopping center owners have basically remodelled the facade of the store itself to death, the city required to keep the sign with its vintage googie look. Here’s hoping the owners will actually follow through, and not find a way to work around the city requirements, or ust leave the project half-done until the sign collapses in a heap of rust.